Think your pet is particularly naughty this time of year? You’re not the only one. 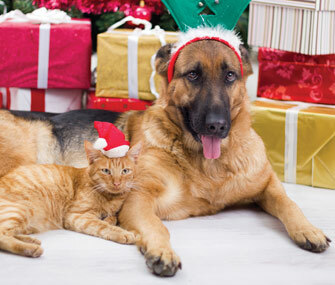 We bet a lot of pet owners can relate to these holiday mishaps. We like to think that our pets are always on Santa’s nice list, but every now and then, they do something, ahem, a little naughty. The holiday season — with its sparkling trimmed trees, luminous lights and perfectly wrapped presents — seems to be an opportune time for dogs and cats to get into mischief (at our expense). It’s a good thing our four-legged friends are so cute, because at the end of the day, many of us can’t help but laugh at their antics. In that vein, we’ve asked our Facebook fans to share the worst “gifts” they’ve ever received from their pets during the holidays. Some of these antics could have ended badly for the pet, though, so be sure to consider how you can avoid having your pet get into this kind of trouble this season. Brace yourself for stories of downed Christmas trees, furry “surprises” and unwrapped, er, ripped-open presents. Reader Sonjalyn Dickson Rine’s cat, Figaro, was all about climbing the Christmas tree and sending it crashing down. “He would sit, walk a few feet away and sit and look back at it, as if to say, ‘Go ahead and put it back up. Make my day,’” Rinesays. Cats really know how to mock us, don’t they? Cats usually get the blame for knocking the Christmas tree over. But dogs do it, too, as evidenced by this story from Facebook fan Angelina King: “Our pups — a Heeler mix and a Siberian Husky — were playing the night after we got our tree up and ran right into it. Needless to say, it came tumbling down and now leans to one side. Ha-ha.” At least King can laugh about it, right? Catching a squirrel is probably the No. 1 dream for most dogs. Well, reader Cindy Lynn Ostergard’s Weimaraner, Katie, made that impossible dream come true. The dog left a dead one at Ostergard’s feet while she was eating breakfast with her mom on Christmas Eve. “Katie was so proud,” Ostergard writes. Oh, we bet she was. Sparky the cat, who was owned by Facebook fan Nora Coombs (and lived more than 20 years), certainly lived up to his, well, electric name. Coombs says “he would pop the twinkle lights off the string and then play with them.” What a shocking habit! Surprise, I Ruined the Surprise! Who cares about unwrapping presents on Christmas morning? Reader Lisa Boone’s daughter’s mini dwarf rabbit took care of that holiday chore by tearing open all the presents under the tree. The rabbit also chewed the boxes open and left paper all over the place. Surprise! We wish you and your pets a happy — and safe! — holiday season. Although we can laugh at the anecdotes above, if your dog or cat does something dangerous like chew on electric cords, scarf down chocolates or find his way to another holiday hazard, contact your veterinarian immediately. Thanks to everyone who shared their stories; if you’ve got one, please write it in the comments below. What Did You Give Up for Your Dog?